Today, I’m excited to announce that Visual Studio 11 Beta and .NET 4.5 Beta will be available in just a few days, on February 29th, 2012. These releases will be “go live,” meaning they will enable usage in production environments. There are a number of industry trends that have significantly influenced the investments we’ve made in Visual Studio 11 and .NET 4.5, and even the engineering processes we’ve used to bring this software to light. Historically, the Developer Division at Microsoft focused entirely on the “professional developer,” on the approximately 10 million people that built software as their primary vocation. Over the last few years, however, the software development landscape has significantly changed. What used to be 10 million developers is now upwards of 100 million, spanning not only “professional developers,” but also students, entrepreneurs, and in general people who want to build an app and put it up on an app store. From professionals to hobbyists, developers today build applications that span from the business world to the consumer world, and that run on a wide range of client and server platforms and devices. As developers, this proliferation of connected devices and continuous services has had a profound impact on the kinds of solutions we build and deploy. More than ever we think about architecting our applications in a service-oriented manner, and more than ever we think about how consumer-like experiences should permeate even the most routine of business applications. In addition to shifts in application patterns, the rising number of developers building apps, the ubiquity of devices running them, and the momentum of apps moving to the cloud, we’ve also seen changes in how these apps are envisioned, delivered, and managed. The online social experiences that we’ve come to rely on for fellowship in our personal lives now also find their way into our work lives. The fast-paced nature of the modern software era has necessitated more rapid ship cycles, with frequent servicing updates, and tools for collaboration and communication have become crucial. Furthermore, this has led to a rise in agile software development practices, and an increased importance of the “DevOps” cycle. It’s with these and other trends as a backdrop that we set out to build Visual Studio 11 and .NET 4.5 and that have guided them to their pending beta releases. All developers, from professionals to non-professionals, need great tools to create modern consumer and business applications that delight users and that span from client to cloud. Towards that end, I’m thrilled at the depth of alignment we’ve had in the development of Visual Studio 11 and Windows 8, which have been engineered together with these goals in mind. The effect is obvious: Visual Studio 11 provides a best-in-class experience for developing apps for Windows. We’ve applied the same level of thoughtfulness across all Microsoft platforms, so whether your app runs on Windows, Windows Phone, Windows Server, or Windows Azure, Visual Studio 11 and .NET 4.5 enable you to transform your ideas for those applications into reality. Being able to build such applications productively is a key piece of what Visual Studio 11 and .NET 4.5 deliver. Whether you spend your work days building enterprise software, or your spare time building the next great breakthrough app, it’s crucial that you make the most of your time spent. Visual Studio 11 combines a simplified development environment with high-productivity features to help you to maximize your time investment. These productivity enhancements go beyond the IDE, and extend through the languages, libraries, and runtimes on which your software relies. Building software is also often a social experience, and an individual developer’s productivity is impacted by the efficiency of the team. 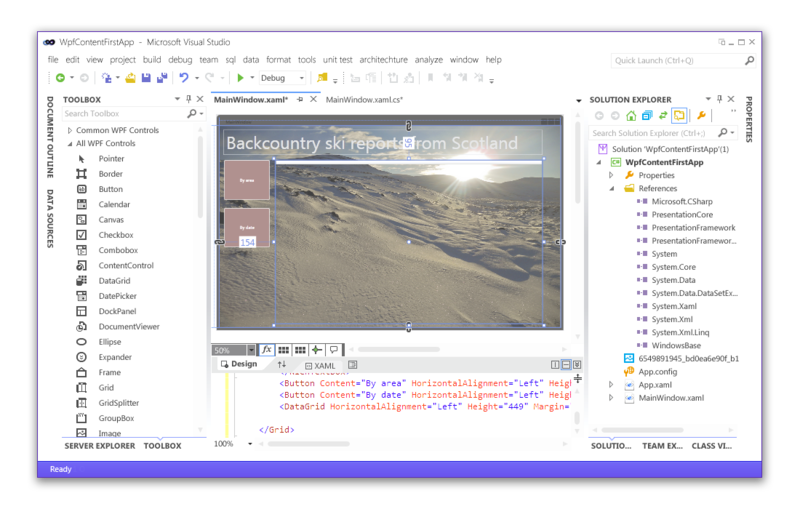 With Visual Studio 11, we enable everyone, from the product owner to the designer to the developer to the tester to the customer, to be empowered to create and release high-quality software and services. These collaboration and agility needs extend from the largest of teams down to the smallest. Team Foundation Server Express, which is free to individuals and to teams of up to 5 users, provides an easy way for those small teams to start embarking on the DevOps cycle. To learn more about the Visual Studio 11 Beta and .NET 4.5 Beta news we announced today, please see Jason Zander’s blog. And as always, I look forward to your feedback as we release the Beta next week. YOU DO REALIZE THAT USING ALL CAPS MAKES IT DIFFICULT TO READ, RIGHT? USING ALL CAPS DOES NOT MAKE IT "METRO", FYI. PLEASE ADD THOSE TWO TO THE STATUSBAR. IT WILL BE AN EXCELLENT IDE FOR ALL MY LOLCODE WORK. Please lose the All Caps in the UI. Your UI experts should know that all caps reduces the shape contrast, making the text harder to comprehend at a glance. I'm looking forward to .NET 4.5, especially the async language changes and the long awaited updates to the Entity Framework (e.g. enum support wahoo!). I HAVE A SUGGESTION FOR PEOPLE WHO ARE ON THE BETA AND HAVE ACCESS TO CONNECT/OTHER FEEDBACK MECHANISM: PLEASE MAKE SURE ALL YOUR TEXT IN BUG REPORTS AND OTHER COMMUNICATION WITH MICROSOFT IS IN CAPS. THAT MAKES IT METRO AND METRO IS THE NEW MICROSOFT DESIGN LANGUAGE. EVERYONE SHOULD ADOPT IT. BREAKING NEWS: OFFICE V-NEXT WILL ALLOW TEXT ONLY IN ALL CAPS. BECAUSE THAT IS METRO. METRO IS THE NEW MICROSOFT DESIGN LANGUAGE. EVERYONE SHOULD ADOPT IT. Please Soma, please, do something so that we at least have an option to use color icons in Solution Explorer. could you please improve VS11 (BETA) in these following areas? – Be more colorful: use colorful icons, and remove all gray color for the background whenever possible; use more white instead. Gray makes me think I'm living in the dark ages, am I? – Use ALL CAPS with caution: please don't use ALL caps unless it's EXTREMELY necessary, or change its style to be less in size (smaller) and more in weight (bolder) in order to justify the making-sense-ness of ALL CAPS. Oh! Dear lord! What have you done !? Thanks for the feedback all! The greyness of the light theme, the limiting of color in icons to status/notification purposes, and the All Caps titling are spurring lots of feedback. These are all areas that we'll be focusing on in coming weeks as we work to leverage your feedback into the best outcomes possible. I shared on the VSBlog today some of the intent behind a couple of these design decisions. My goal in sharing the intent is to spur further conversation of how to best achieve as many of the design objectives we are shooting for as possible. Our primary intent with the grey color palette choices was to put more of the focus squarely on your code. The design rationale that led us to the All Caps titling was to rely as much as possible on the use of typography and whitespace to create structure and emphasis in the UI. All Caps allowed us to provide more shape to tool windows as UI containers without having to add in quite a bit of extra line work. With regard to relegating color within icons to only notification and status changes, what we are targeting is to free up color to have a more systemic role in the user interface. Please keep the feedback coming! We realize how important Visual Studio is to many of you and we genuinely want to provide you with the best experience possible. Please bring back the colors to Visual Studio. It is ok if the default theme is grey but please make it skinnable to other colour themes. I really hate to see something so bland and tasteless 12 hours a day. Yes, I believe we read the rationale for these changes but it is not working for most of us. Colours are very important. Colours creates the mood, creates the inspiration. Also, when non-developer decision makers sees the so-called UI improvements from VS 2008 to VS 2010, it was really a good sell. But how are we going to impress our decision makers to upgrade if the tool looks so old fashioned? Why you need to use all caps and :::: for fillers is because you don't use a simple colored title bar for each section. The design is already creating problems. I hope the VS team will spend more time making the IDE more stable instead, rather than messing around with the UI. What we need is a pleasant IDE that can inspire us to develop better looking apps. If this obsession with "metro-fication" continues uncontrolled to all products creating such bland UI, you are indirectly telling users to move on to other more fancy looking i.e. Apple. Please do not kill the best IDE on the planet. I look forward to the new Visual Studio however please do away with the CAPS. It looks terrible. And the coloring is so dullboring compared to previous versions…so boring. CAPS LOCK looks wrong, because it isn't consistent with the typography of Metro UI in Windows Phone 7 or even Zune App. the new UI is ugly. please give us an option to change it back to the VS10 UI. I can not believe my eyes…I can't believe that monochrome isn't an *option* for those that want it. I realize some may like monochrome, but trust me…many do not. For me, it's absolutely repulsive and nauseating. Please allow those of us who want to, to keep the VS 2010 look. Please. "These are all areas that we'll be focusing on in coming weeks as we work to leverage your feedback into the best outcomes possible." "Please keep the feedback coming!" Only if you promise to talk like a normal human being to us, okay? Hideous, can't believe anyone there seriously thought that this is an improvement over VS 2010. Dull and depressing and the icons are awful, people use both color and shape to recognize them. Ditch it, no way would I use it. Sorry Monty this just doesn't work, colour icons aren't and have never been distracting and are important for productivity. I really don't know why your study said different. You can glance at a "standard" toolbar and instantly pick out many icons just by their colour, their shape is secondary. It's even worse when you have variations (say, add file, edit file and delete file) you really have to look for the mono icon compared to a colour version. There is so much wrong with this new UI I don't even know where to start. Look how many negative comments you are seeing … how did this even get to see the light of day? You need to scrap this idea and try again … with color next time. 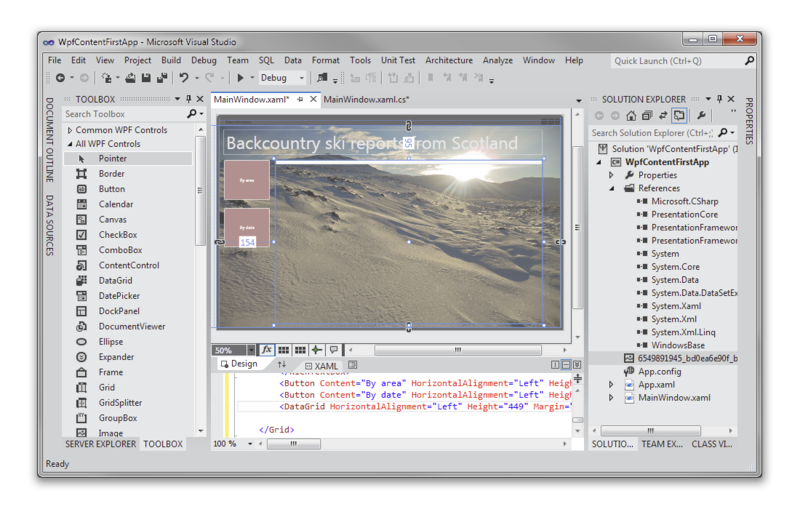 Visual Studio 2010 is a thing of beauty, possibly the best product Microsoft ships. Just starting it gives me a nice feeling, thinking about all the possible things I can easily create with it. Please don't stuff it up. With a UI change for the sake of making a change. It is not broken. We live with the Monochrome interface of Expression Blend because "hey maybe Designers wanted the menus out of the way so they can "see their design". And we programmers are a secondary audience. But don't let that confuse you into thinking we want it in VS11. The "colorful interface with camelcase text" *IS* part of what makes us productive. The menus, toolbox, hierarchies need to be big with many alternatives in order to cater for the wide variety of possible development projects. We use the variety of shape & color to navigate that complexity quickly & efficiently. They do not "get in the way" of what we are doing, they are an intrinsic part of what we are doing. The square block look of Metro while OK on a tiny phone, has yet to prove itself on a 30" screen. Perhaps it is too early to follow it as a best practice. I will not be surprised if PC Users voice a less than positive reaction to the new Metro UI. Note: SQL2012 SSIS changed the dataflow icons from the easy-to-see background color change of SQL2008 to tiny little green ticks. Which are impossible-to-see when a large dataflow is zoomed out to fit on the screen. Thus while it may look good to the designer, they overlook how it will be used in production. It wasn't broken, now it is. Please leave the VS10 UI as it was. Or give us the config option in VS11 to "unbreak it"
Greyscale icons, caps lock? Are you kidding me? It's not April Fools' Day yet. Office 15 is going the Metro UI direction, too, but WITH COLORED ICONS. How important is Color to VS users? Color is so important, it's the core of Syntax Highlighting! 1. Finally, we can go with an all-white background just like Office 15. 2. Solution Explorer Icons are now colored, too. 3. Improved Typography and Type Color: Text Boxes, Trees, Tab Text, no stone is unturned! As long as VC++ compiles small executables and the Class Viewer is fixed… it will be OK and may even make me consider the switch from my old and obsolete compiler (if and only if can compile executables for Windows XP et.al. via tool-sets). I am not overly concerned about the latest sophisms coming from the team: lack of colors and letters in caps, as long as the IDE serves its main purpose. And if it has many colors and the proper fonts and letters sizes but fails in its main purpose?. This raises a new concern: what if the compiler doesn't live up to our expectations? That would be a cause of serious concern indeed and unfortunately we can't rule out that possibility: with 100M programmers, loosing 1 or 2 millions will have very little impact in their users base. I think they should add the Ishihara test to the list of prerequisites for VS2011 to check if the lack of colors may have any impact in our productivity: this IDE will NOT be a problem for people with some degree of monochromacy or color blindness. Unfortunately (or fortunately), only 0.00001% of the population is affected, therefore, I guess it will not be very popular among the other 99.99999%. The new style is a good example of what happens when somebody emphasizes too much a false sense of individualism and originality to the point of being odd. The other day I was thinking about how much this tools have become so heterogeneous to the point that I reflected that Visual Studio should be better named Frankie after Dr.Frankenstein, their authors being like modern Dr. Frankensteins, amalgamating parts from different bodies (technologies) into a single body (IDE) and the result being an unmanageable monstrosity. Ok… All caps not good. No color still worse. Please realize that developers spend large amount of time with the IDE everyday (as high as 10 hours a day). So the look and feel has to welcoming, soothing, relaxing etc. No color doesn't make it all of that. VS 2010 look and feel is awesome; please dont ignore it totally. Got a question. Will this beta release support development of Metro style apps on 32 bit machine? Looking forward to try hands on! Regarding your question, if you're running Visual Studio 11 and Windows 8 on a supported configuration (either 32-bit or 64-bit), you can build a Metro style app. Please do give Visual Studio 11 Beta a try when the bits are released on Wednesday. We look forward to hearing any and all of your feedback! So, UI vision by thenonhacker deserve to be considered. >Office 15 is going the Metro UI direction, too, but WITH COLORED ICONS. How >important is Color to VS users? Color is so important, it's the core of >Syntax Highlighting! Dev11 looks interesting, but will we finally be able to rename TFS team projects? It's the number 1 TFS suggestion on Uservoice and it's been a pain point for years. It doesn't matter how many new features you put VS and .BLOAT if you wont fix the stuff that has been broken since it first was released.. I truely have ZERO respect for you and your developers, personally I feel you and your developers are completely incompentent! You have not released anything that even resembles stable software since visual studio 6.0.
is that VS code named 'ALBINO'? Joke beside: This is a bad piece of UI. Somebody must have told you guys at MSFT that structure and distinction between UI-elements isn't a design goal any more. Just look at the project-property screen. In vs10 there is a clear relation between the 'tab' cards on the left and the content on the right. A good visual clue, that one has to click on the item left to view content on the right. Now there are some labels that are clickable (how to distinct which ones are and which aren't?). Just like Blend, one has to move the mouse over and be surprised whether the elements appearance changes (hence probably clickable) or not (it's only a dumb label or symbol). This is terrible, absolutely terrible. Colour is an absolutely vital signal for discerning objects from one another. I can immediately tell which entries are folders in Solution Explorer, for example. If I'm distracted from my code (I can't imagine this is an issue for any professional coder to be honest), I'll change the editor theme or minimise the windows I find distracting. Microsoft deciding to change the UI for ALL users because of an imagined issue is bizarre and fundamentally wrong. We never asked for this. I know you're trying to apply Metro principles to everything, but this is a product which just doesn't need it. All caps is atrocious, too – readability should trump design EVERY TIME. If you continue with this trend, you will be reducing productivity, not enhancing it. I'll try out the beta on a VM, but if the UI isn't changed back, I'll most probably stick with 2010. As a compromise, maybe you could add the colour back to the icons when the corresponding window is moused over? This wouldn't be perfect by any means, but it's better than nothing. jbooker: Yes, the beta will be publicly available on Feb 29th. The interface on VS 11 is awful obviously been drinking the same kool aid of the people who think Metro is useful on large desktop systems. I pirated VS10 because of the poor upgrade pricing from VS2008 but I cant even see me even bother to pirate this regardless of the pricing. PS can someone at Microsoft get the designers a new keyboard the caps lock on theirs appears to be stuck. In my experience the Beta "look and feel" doesn't always translate through to the final release. something so that we at least have an option to use color icons in Solution Explorer.